After Sascha RIng aka Apparat paid tribute to the beauty of melancholy and loneliness on his last album "Silizium" (shitkatapult strike 53), he this time around has connected melancholy with the necessary push to the dance floor on "Berlin, Montreal, Tel Aviv". These tracks were recorded live over the course of the last year in the most prolific clubs in each of the named cities. Apparat is presenting himself more or less just like people have come to know him that have seen him play live: as a rave dog with a fragile head. “Berlin” documents the blues of this city like no other piece has yet before. The warm melodic parts are being carried by abstract beats. It grows into powerful freeing eruptions after the lengthy build-up of suspense. "Berlin" is thus the deepest track on this EP and is great fodder for DJs who have the courage to get emotional. “Montreal” contains parts from the opera "Pia" of Gianna Nannini. Sascha Ring sat together with this pop legend from the 80s working on her album. Here he shows us what can happen with this kind of sound material when he is given free reign: it's an electro track that also utilizes some synth pop elements, however far away from retro it is. 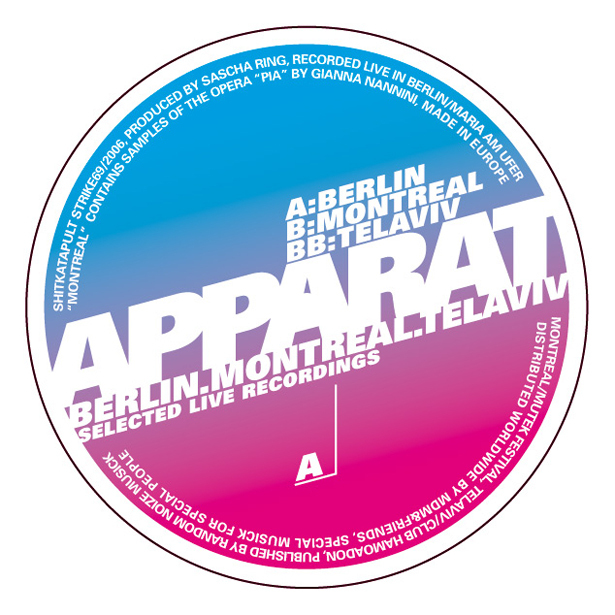 “Tel Aviv” is the most pulsating track on the EP and gives us a more unknown look into the darker sides of Apparat's soul with very determined brute sounds. All this is counteracted with some absurd happy and at the same time longing melodies and there you have it: thee burner of all three tracks is complete for this EP! Apparat himself sees spanish rave monster clubs as the best place for these compositions. At the least, however, they deliver a long awaited example and explanation why Apparat is a live act in high demand all across the globe. Listen up!